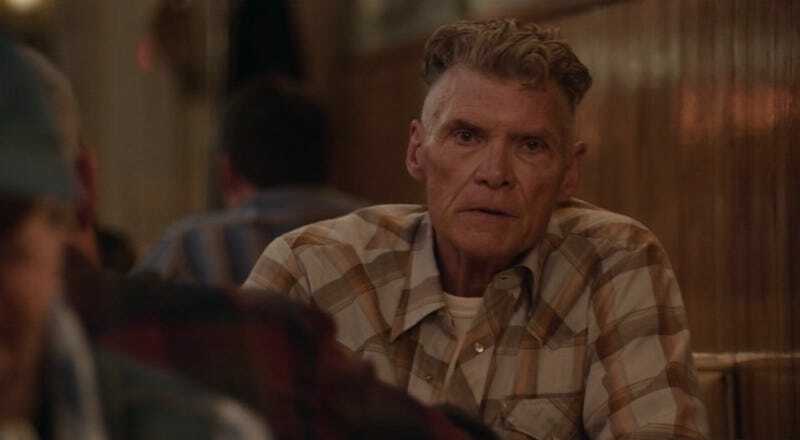 One of the greatest love stories on the original Twin Peaks was the fiery passion between former high school sweethearts Big Ed (Everett McGill) and Norma (Peggy Lipton). Though they broke up and married other people, they continued to ardently pine for each other. Last night on Twin Peaks: The Return, we got an update on their situation. Many viewers (including me) hoped that The Return would see the couple finally together and happy after all they went through in the 1990s. Back then, Norma’s husband, Hank (Chris Mulkey, who’s not on The Return), got out of jail and immediately returned to his creepy criminal ways—and Ed’s wife, Nadine (Wendy Robie), went from regular-crazy to batshit-crazy after waking up from a suicidal coma believing she was back in high school. Norma hasn’t had much to do this season other than hang out at the diner and react to the endless family drama that Shelley (Madchen Amick) has to deal with. Last night there was more of that—but she also finally got her own scene, discussing the financial situation (and pie-quality consistency) of the RR’s multiple franchises with her very tanned business associate, Walter (Grant Goodeve). The specifics of what’s going on with the restaurant don’t matter. What matters is that when the scene begins, Norma’s sitting in a booth with Big Ed, giving us our first glimpse of him in season three. Again, many viewers (including me) immediately hoped that YAY THEY ARE FINALLY TOGETHER! They invite Bobby (Dana Ashbrook)—you remember Bobby, he was Laura Palmer and Shelley’s boyfriend, back in the day, and is now a deputy in Twin Peaks—to join them because, as Big Ed says jovially, “It’s no good eating alone.” It’s a really nice moment of togetherness between three characters we’ve been following since Twin Peaks’ very first episodes. When Bobby offers to give them privacy, Ed assures him, “No reason, pal. Nothing happening here.” He’s all smiles. But... he’s got a wedding ring on. And Norma doesn’t. And when Walter—who dismissively can’t remember Ed’s name—appears, he gives Norma a hello smooch that makes it seem like they’re much more than just friends and business partners. She’s flirty with him, too. Ed’s face while he watches them interact from afar says so much. He’s still in love with Norma after all these years, though he’s almost certainly still married to drapery connoisseur and “Dr. Amp” enthusiast Nadine. As we learned on the original Twin Peaks, his guilt over accidentally shooting out her eye means he’ll never leave her. Who could blame Norma, who certainly deserves to find her own happiness, for deciding some years ago that it was finally time to move on? The knife twists even deeper in the episode’s very last scene, which isn’t the by-now-customary musical number. It’s Big Ed, sitting silently at his gas station, eating what’s clearly his diner meal taken to go, and idly lighting a piece of a match book on fire as the credits roll.